when it needs to be said, it needs to be said with kindness, sincerity and thoughtfulness. I created this card for my best friend's mom who recently lost her brother. Unexpected losses can hit pretty hard. I wanted it to be feminine, subtle and quietly pretty. Aqua Paint Crisp Cantaloupe ink wash onto Watercolor Paper. Let dry. 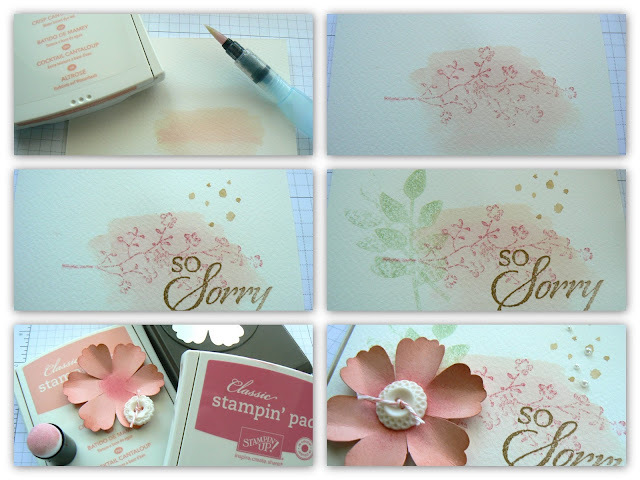 Stamp flowers with Strawberry Slush ink after "stamping off" to lighten image. 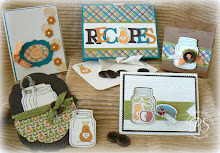 Stamp sentiment using Baked Brown Sugar ink. Using Aqua Painter, stamp random dots. Lightly stamp leaves two times onto card front using Pistachio Pudding ink, stamping off first to lighten image. 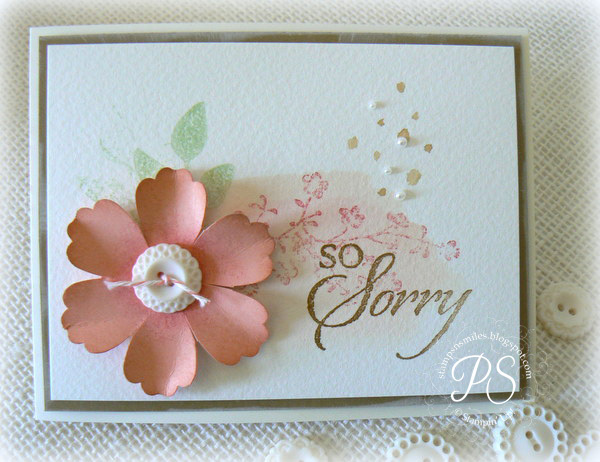 Punch flower from Crisp Cantaloupe card stock using Blossom punch. Ink edges with Crisp Cantaloupe and center with Strawberry Slush using Sponge Daubers. Fold petals slightly. Adhere to card front with Glue Dots. Tie Bakers Twine through Very Vintage button. Adhere to card front using Glue Dots. 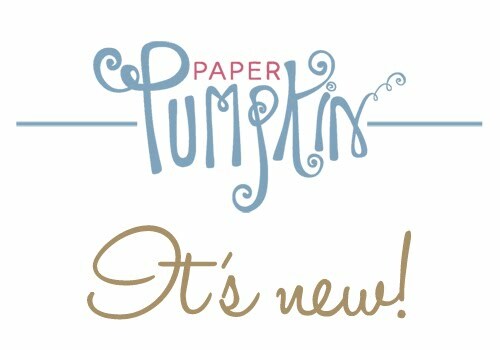 Shop online through my Stampin' Up! 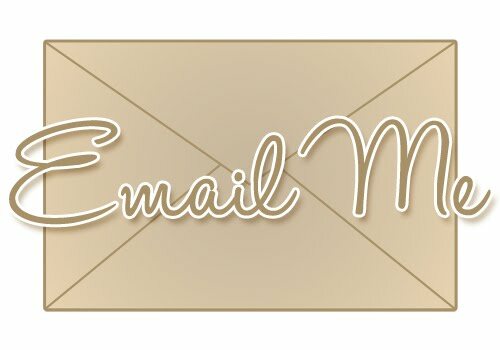 site - click here to begin! 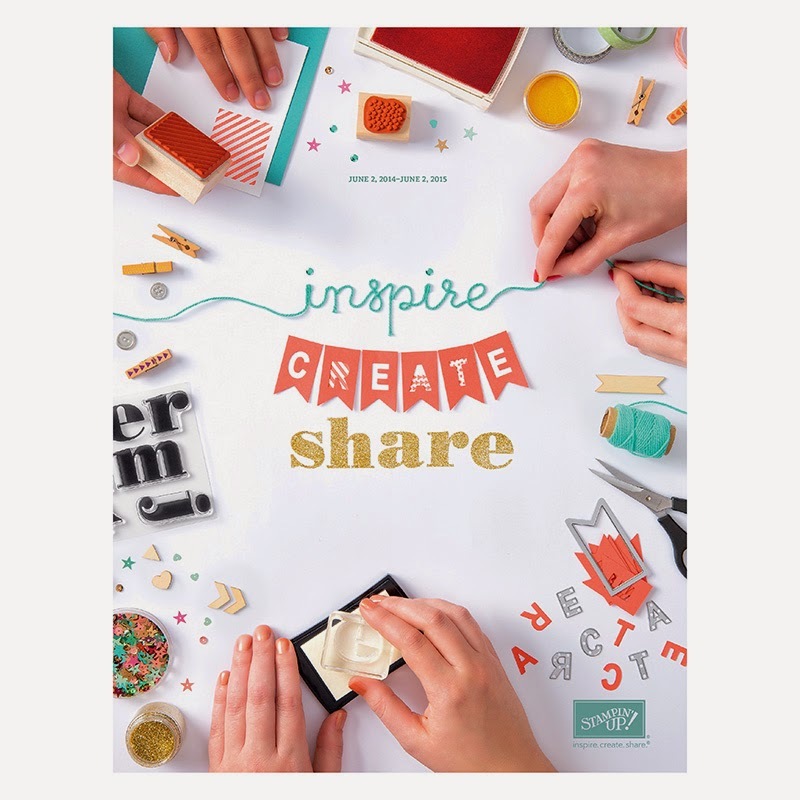 Thank you for sharing this beautiful card and the instructions how to make it. Love the soft colors. 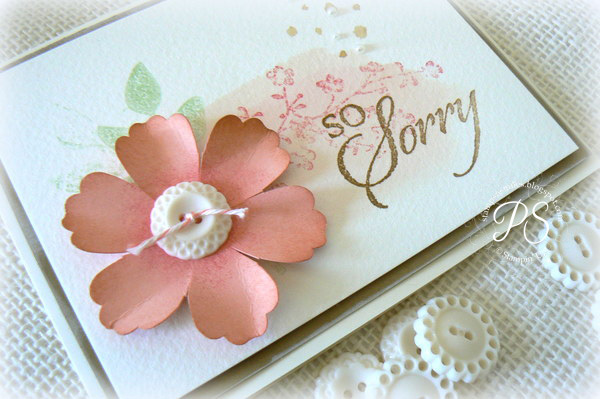 It's a sad occasion but your card is beautiful. Such a pretty soft card, thanks for sharing how you made it. I love your creations! stunning; what a keep sake! This is such a stunning card, Penny. I am sure it will bring great comfort. This card is so beautiful! Thank you for the instructions! I love the softness of this beautiful card.